Grand Portage National Monument preserves a vital center of 17th and 18th century fur trade activity and Anishinaabeg Ojibwe heritage. This past June, 30-year-old Mikah Meyer set out from Washington, DC on a roadtrip across America to visit more than 400 sites within the U.S. National Park system. And VOA has been following him as he travels from state to state. Thanks to the stunning photographs and videos Mikah and his travel companion Andy Waldron have been sending us, we have a virtual front row seat to some of the most amazing land and waterscapes within the U.S. national park system. As one observer recently noted, it’s almost as good as being there. Grand Portage National Monument sits along the coastline of Lake Superior in the northeastern corner of Minnesota near the border to Canada. The park was created to preserve the rich history of the area, once the center of a thriving fur trade, and home -- then and now -- to the indigenous Ojibwe tribe. At the park's bustling partially-reconstructed fur trade depot, Mikah visited a Native American encampment exhibit. 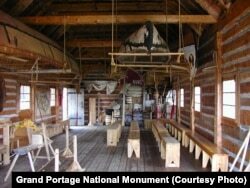 The canoe warehouse at Grand Portage National Monument houses several of the park's birch bark canoes. He was also able to check out a fine collection of birchbark canoes, which were the primary mode of water transportation among Native Americans, and the principal means for shipping pelts to market during the fur trade among both the natives and the Europeans. Birchbark canoes were resilient and waterproof; qualities that made them an ideal vessel for transporting goods, Mikah remarked. The curious adventurer also got to see -- and touch -- examples of animal pelts that were common during the fur trade. It was fascinating to feel the different textures, Mikah said. And in learning about the area’s history, he commented on how impressed he was by how people from different cultures were able to work together for a common goal. Mikah Meyer checks out a variety of animal pelts at the Grand Portage National Monument in Minnesota, including raccoon, badger, arctic fox and red fox. “The French, the British and the Native Americans all worked together to create this economy,” he said, adding, “This is one of the few stories I've ever heard of Native Americans interacting with the Western Europeans that isn't a tragedy." 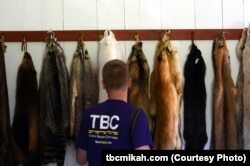 The fur trade in North America lasted from the 17th into the 19th century. And while demand for fur in the United States has steadily decreased over the years, it is still a viable trade in other parts of the world. Mikah spent the last days of July in Minnesota's Voyageurs National Park, a giant peninsula that reaches into Lake Superior. Here, he was able to touch rocks “half as old as the world,” immerse himself in the sights and sounds of a boreal forest and ply some of the interconnected water routes. Mikah was struck by the lack of development in the park. “So you can go out to this peninsula and there are over 200 islands over one-acre each in size and they have no houses on them, there are no hotels,” he said. “This is raw, natural nature as it would have been hundreds of thousands of years ago, as evidenced by the over 50 pairs of nesting bald eagles,” he said. As August begins, Mikah and Andy are starting their drive across the state of North Dakota, where they plan to visit three national parks. To follow Mikah and learn more about the places he’s traveling to, he invites you to visit him on his website.